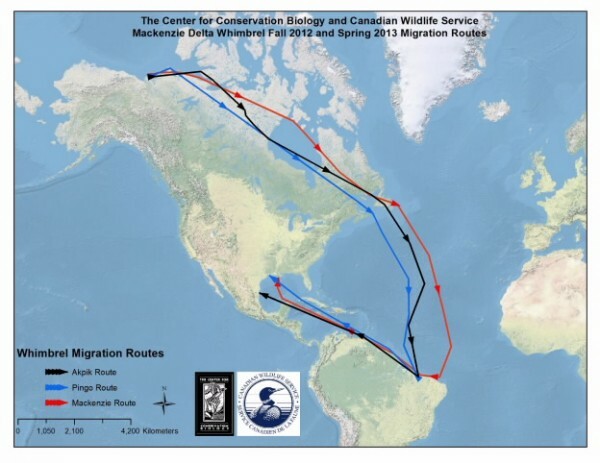 Tracking map – Map of migration route used by Hope from Southampton Island in upper Hudson Bay to near the Virgin Islands. She has been tracked using a 9.5 gram, solar-powered satellite transmitter. (Williamsburg, VA)—Hope, a whimbrel carrying a satellite transmitter, is far out to sea flying south over the Atlantic toward her wintering grounds in South America. The bird had been staging on Southampton Island in the northern reach of Hudson Bay since 15 July before leaving on a non-stop flight south on 10 August. 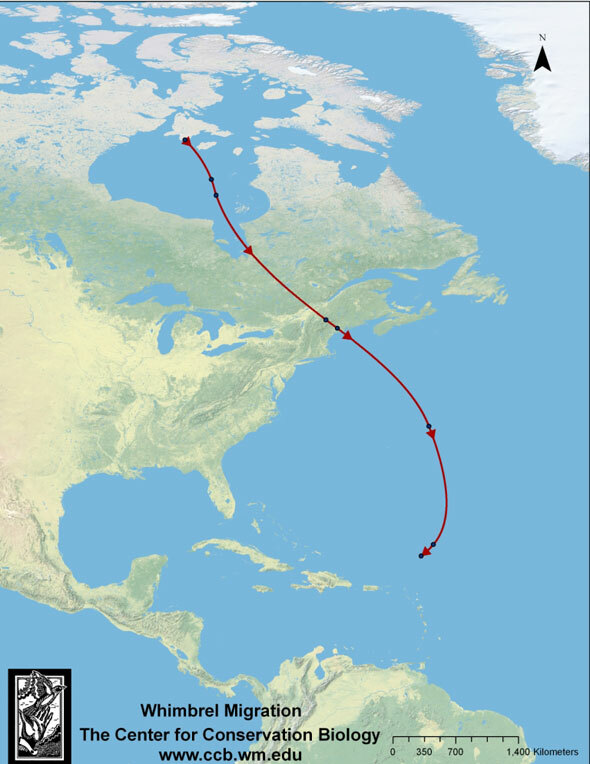 The bird flew south over Hudson Bay, crossed the interior of Canada and New England to emerge from the coast of Maine and out over the open ocean. Flying more than 1,600 kilometers (1000 miles) out over the ocean and east of Bermuda, Hope then turned south and is now moving toward the Caribbean. She has already flown non-stop for more than 5,100 kilometers (3,200 miles) but is still 400 kilometers (250 miles) from the nearest land in the Virgin Islands. So far, Hope has been on the wing for 4 days with an average flight speed of 60 kilometers/hour (37 miles/hour). Hope was originally captured and fitted with a satellite transmitter on 19 May, 2009 while staging on the Delmarva Peninsula of Virginia. She left Virginia on 26 May and flew to the western shore of James Bay in Canada. She staged on James Bay for 3 weeks before flying to the MacKenzie River near Alaska and then on to the Beaufort Sea where she staged for more than 2 weeks before flying back to Hudson Bay. Hope has traveled more than 13,000 kilometers (8,000 miles) since late May. Hope is one of several birds that have been fitted with state of the art 9.5 gram, satellite transmitters in a collaborative effort by the Center for Conservation Biology at the College of William and Mary – Virginia Commonwealth University and the Virginia Chapter of the Nature Conservancy to discover migratory routes that connect breeding and winter areas and to identify en route staging areas that are critical to the conservation of this declining species. Updated tracking maps may be monitored online. The whimbrel is a large, holarctic, highly migratory shorebird. The North American race includes two disjunct breeding populations both of which winter primarily in Central and South America. The western population breeds in Alaska and the Northwest Territories of Canada. The eastern population breeds south and west of Hudson Bay in Manitoba and Ontario. Both populations are of high conservation concern due to dramatic declines in recent decades. Satellite tracking represents only one aspect of a broader, integrated investigation of whimbrel migration. During the past 2 years, the Center for Conservation in partnership with The Nature Conservancy and the U.S. Fish and Wildlife Service has used conventional transmitters to examine stopover duration, conducted aerial surveys to estimate seasonal numbers, collected feather samples to locate summer and winter areas through stable-isotope analysis, and has initiated a whimbrel watch program. Continued research is planned to further link populations across staging, breeding, and wintering areas and to determine the ecological requirements of whimbrels staging along the peninsula. 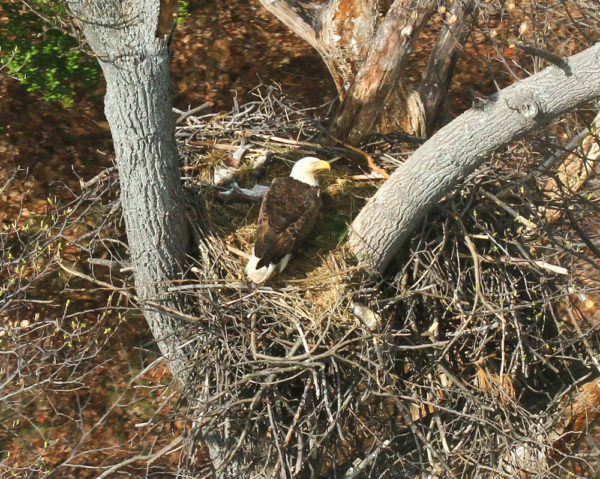 An adult eagle broods two small eaglets in a nest on Fort Belvoir along the upper Potomac River. On the menu this day was American shad and gray squirrel. 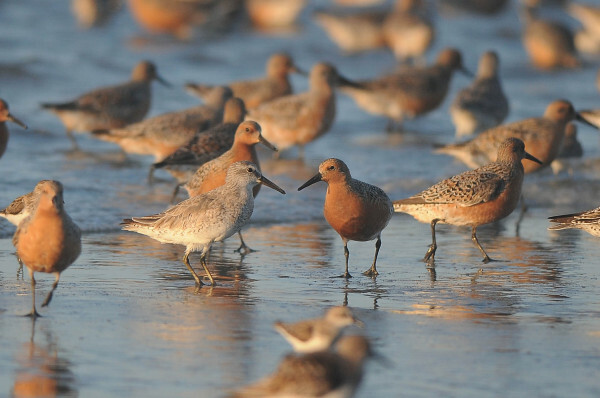 A flock of knots foraging at a Georgia stopover site.